It is reassuring to know that even politicians can have a laugh and take a bit of ribbing…well, Scottish ones, at least. 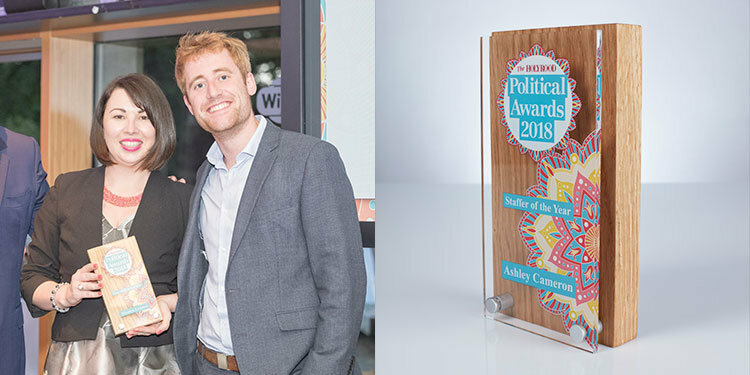 The first ever Holyrood Garden Party and Political Awards took place June 21, and was billed by Holyrood Magazine as an irreverent occasion where politicians, their advisors, staff and the like should put aside political differences and have a laugh and a good time. Host for the evening event held at the Botanic Gardens, Edinburgh was satirist Matt Forde and the trophies commissioned from Special EFX. The oak and acrylic awards featuring the patterned petal graphics of the event were spread liberally around all parties. Whilst awards such as Backbencher of the Year, presented to Scottish Labour Party member Mark Griffin, was certainly awarded on merit, reflecting such achievements as introducing the Neonatal Expenses Fund and a soft opt-out system for organ donation, in contrast, Alex Cole-Hamilton’s accolade was the Flushable Motion of the Year for lodging the most absurd motion in Parliament. In fact, the Lib Dem MSP was nominated for two motions: the first congratulating a take-away for achieving 10th place out of 10 in Just Eat’s highest ranked takeaways and another that a character in the SNP party political broadcast resembled a well-known journalist! Even if Cole Hamilton’s approach in parliament was not unanimously celebrated, the trophies for the event certainly were: “The Trophies were really impressive and admired by all. The colourful logo set against the wood and glass tied in beautifully with the venue and style of the event”.